Ausdrill subsidiary African Mining Services (AMS) has been awarded an $US88 million ($123 million) contract extension with Ghana Manganese Company. Ausdrill has reaped the benefits of last year’s Barminco acquisition, posting significant increased profit and revenue over the last half year. Ausdrill has won a series of mining services contracts in Western Australia worth $171 million, including underground work with Regis Resources via last year’s acquisition, Barminco. Ausdrill has completed the acquisition of underground hard rock contractor Barminco, creating the second largest Australian mining services company by revenue. African Underground Mining Services (AUMS) has been awarded a $US375 million ($529 million) underground mining services contract at AngloGold Ashanti’s historic Obuasi gold project in Ghana, West Africa. Ausdrill has completed the retail component of its $250 million entitlement offer on Barminco, thus finalising its equity raising that was first announced in August. The mining services company, the first to ever present at Diggers & Dealers, is targeting another phase of growth as it prepares to welcome a new leader. Mark Norwell has been appointed as Ausdrill’s next managing director and chief executive officer to replace Ron Sayers. Ausdrill’s shares have dropped by a quarter this week due to ongoing contract negotiations regarding the Wodgina project, as well as delays arising from the rock fall at the Kalgoorlie Super Pit in the Goldfields, both in Western Australia. Ausdrill has confirmed that employees from subsidiary, African Mining Services, are safe following a security incident at its contract with Hummingbird Resources at the Yanfolila gold operation in Mali. The African Underground Mining Services (AUMS) joint venture between Ausdrill and Barminco has secured a mining services contract with Canadian-based miner SEMAFO at the Siou gold operation in Burkina Faso, West Africa. Mining services company Ausdrill has launched operation of an x-ray technology that the CSIRO hopes will revolutionise a 500-year-old method for detecting and analysing unseen gold. Ausdrill has completed a deal to sell its Diamond Communications business to Powerlines Plus after a 19-year association. 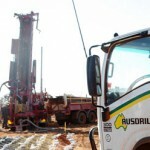 Ausdrill has recorded excellent results for its first half-year report in 2018, posting post-tax profit increase of 163.5 per cent to $35.3 million for the period ending December 31 last year.